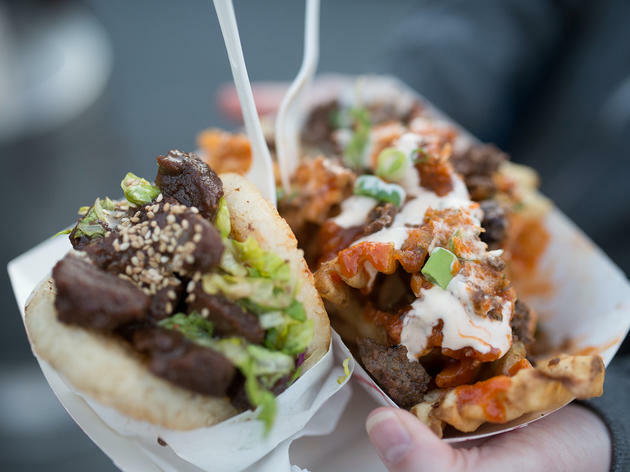 A combination street festival/eating extravaganza, Off the Grid events take place all over San Francisco and feature a mind-boggling melting pot of ethnic cuisines, plus music, crafts, beer gardens and activities. Families shouldn't miss Picnic at the Presidio on Sundays (April–Oct), a giant gathering on the lawn of the Presidio's Main Post overlooking the Golden Gate, with food vendors, free lawn games, music and a “bubble bar” for grown-ups. Twilight at the Presidio (April–Oct) is a Thursday night “campout” with lantern-lit dining cabanas, cocktail service, Adirondack chairs, s'more fire pits and live music. This place is awesome! Located at the Fort Mason Centre (which is a little hard to find! ), we were recommended this place by a friend. We arrived on Friday to SF, and headed here for our first night's meal. There were so many stalls to choose from...I had my first Shrimp Po Boy, and my partner had beef bulgogi encased in buns made of sticky rice! She thought it was delicious, and loved the innovative way the buns were made (see photo on left from TO). As well as this, we met some lovely locals! 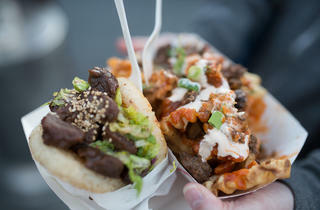 I visited SF back in October (I'm from the UK) and the highlight for my trip was undoubtedly the food trucks at Off The Grid. The variety is without doubt some of the best i've ever experienced - London i'm sad to say does not compare when it comes to SFO street food. Hightlights for me include the Pad Thai from Phat Thai and the chocolate cover bacon from Bacon Bacon - more for the sheer novelty than the flavour, which was a little disappointing (the bacon needed to be crispy!). I love that OTG pops up on the daily in different parts of town, and there is always a new truck to try. I'd love something like this back in London... it would work so well, and the standard of food would be adored by everyone here. Are you ready for July 4th long weekend? I have some suggestions for fun things to do! Check out Verlocal, there are a lot options!